UT Tower plays “Home on the Range” and “The Eyes of Texas” before 1 p.m. peal. 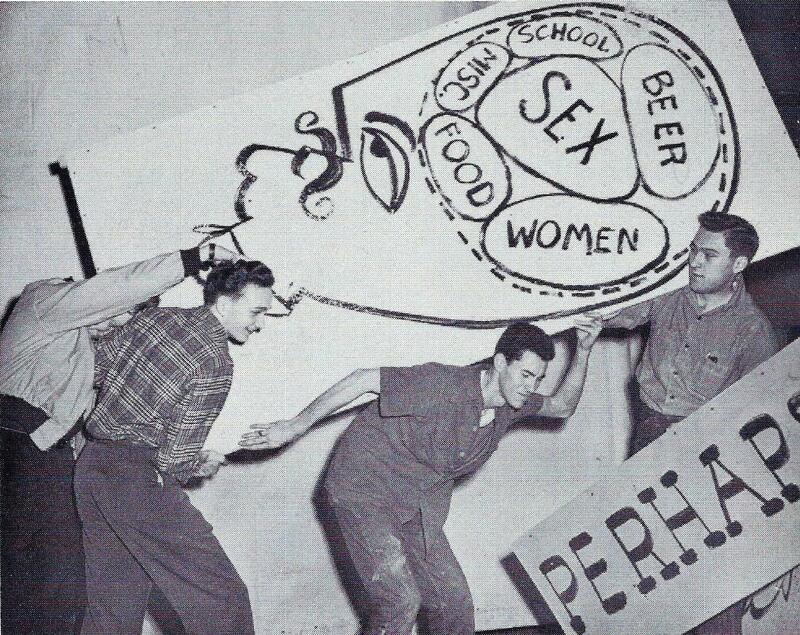 In 1953, the Cactus yearbook staff decided to try an experiment. 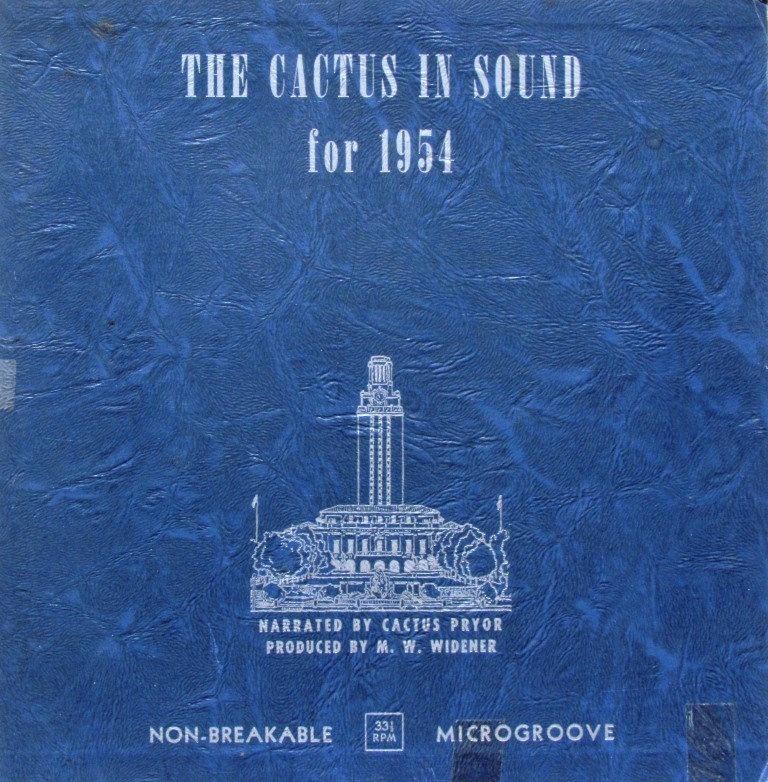 Instead of documenting the academic year only through photographs, what if the Cactus created a sound archive as well? The staff recruited Richard “Cactus” Pryor, then a UT alumnus and well-known humorist and radio personality, to serve as narrator, and then promptly set out to record some of the highlights of the school year. 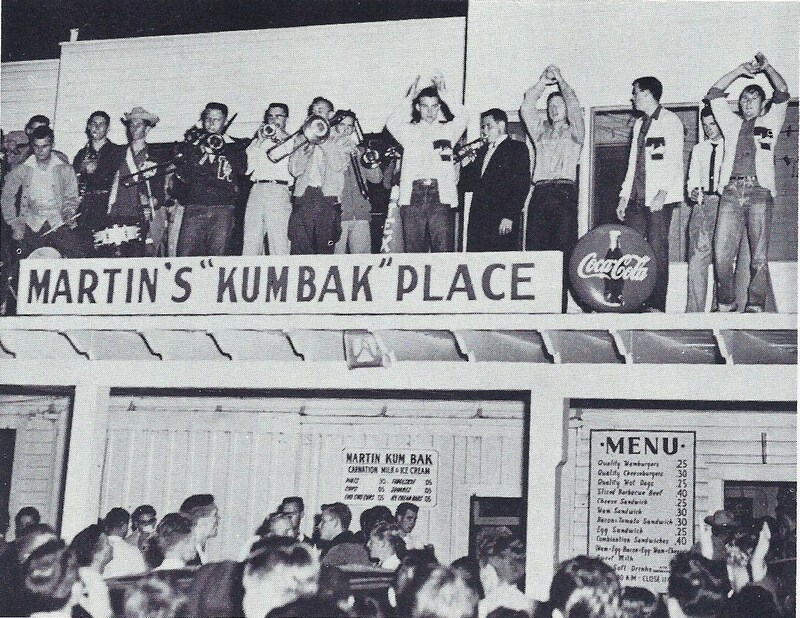 Above: While “official” football rallies were held in Gregory Gym, UT students in the mid-1950s often staged their own, like this one at Martin’s “Kumback Burger” restaurant. Longhorn Yell: L-O! L-O! L-O-N-G! H-O! H-O! H-O-R-N! L-O N-G H-O R-N, L-O N-G, H-O R-N. L! O! N! G! H! O! R! N! Longhorns! Longhorns! Yea, Longhorns! 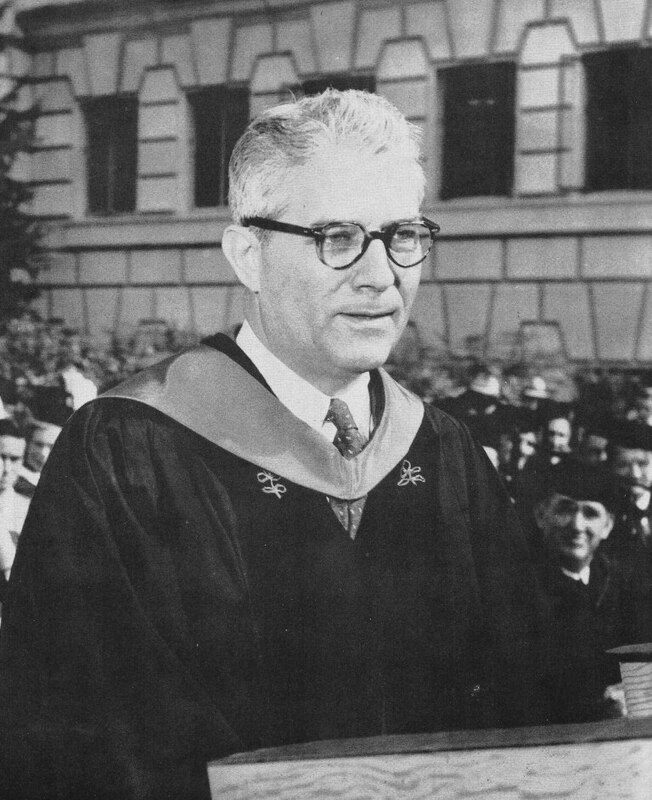 President Logan Wilson: On October 29, 1953, in a ceremony on the steps of the Main Building, Logan Wilson was formally installed as President of the University of Texas. Part of his inauguration speech is here. The variety show was a great success and launched a 25-year University tradition. At the start of the academic year, interested groups of students submitted scripts of potential shows along with sample songs. The Theta Sigs would select a winner and award a cash prize, and the chosen team would perform their show in Hogg Auditorium the following January. The scripts and songs poked fun at campus life, and performances often played to sold out audiences. 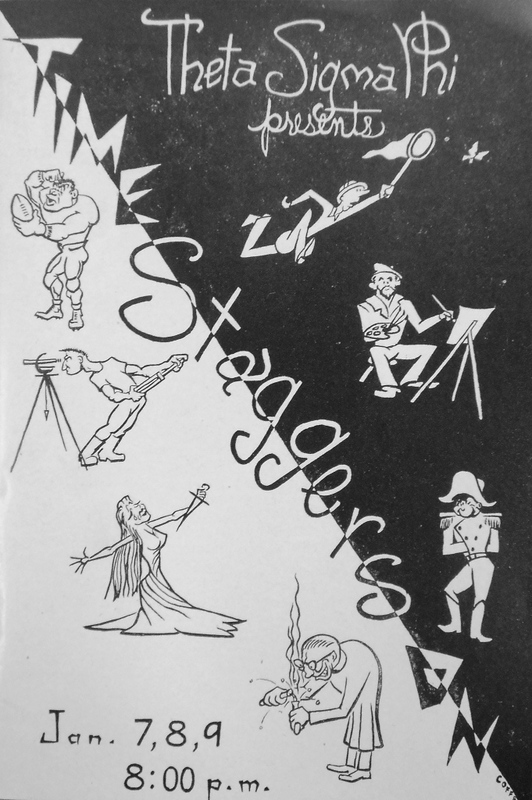 Above: “Priorities of a college man” from the 1954 rendition of Time Staggers On. Round Up: Intended as a spring homecoming (to “round up” the alumni), Round Up was launched in April 1930 with the dedication ceremonies for Gregory Gym. Within a few years it became the social highlight of the spring, scheduled in tandem with the Texas Relays. Parties, dances, an elaborate Friday afternoon parade down Guadalupe Street and on through downtown Austin, and the selection of the UT Sweetheart were all part of the festivities. Round Up as an alumni homecoming was discontinued after 1990, but the University Greek community still sponsors a “Round Up” party weekend each spring. 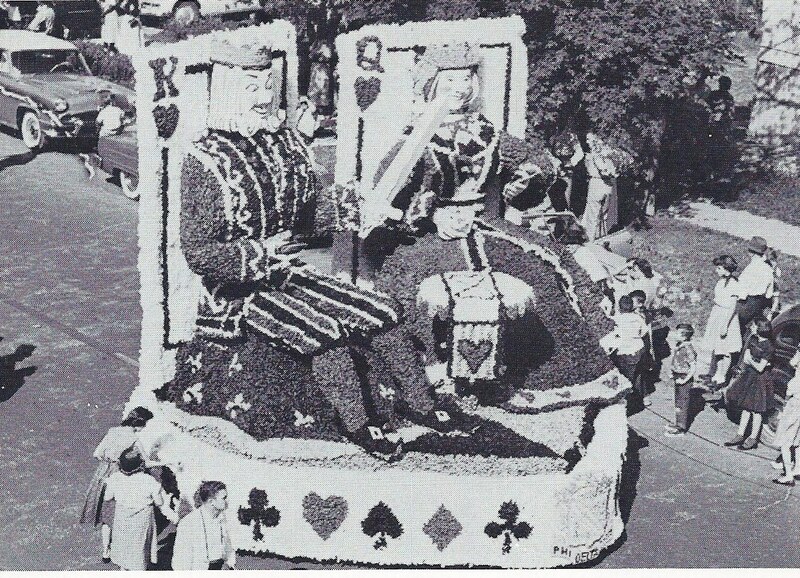 Included on this recording is the announcement of the best float in the parade (above left), the performance of “Hard Hearted Hannah” in the Round Up Review, and the Gregory Gym announcement of Barabra Booz (photo at right) as the UT Sweetheart. 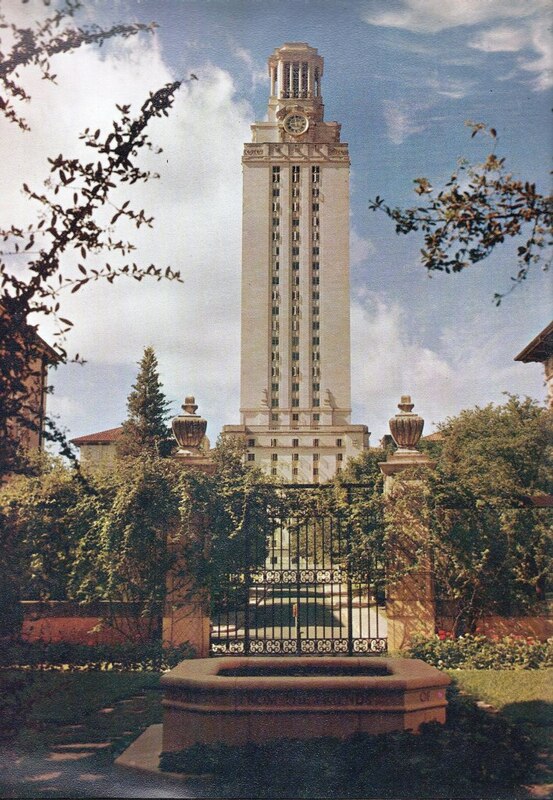 UT Tower Chimes: Some things never change. This recording of the Tower bells more than 60 years ago might be heard on campus today. 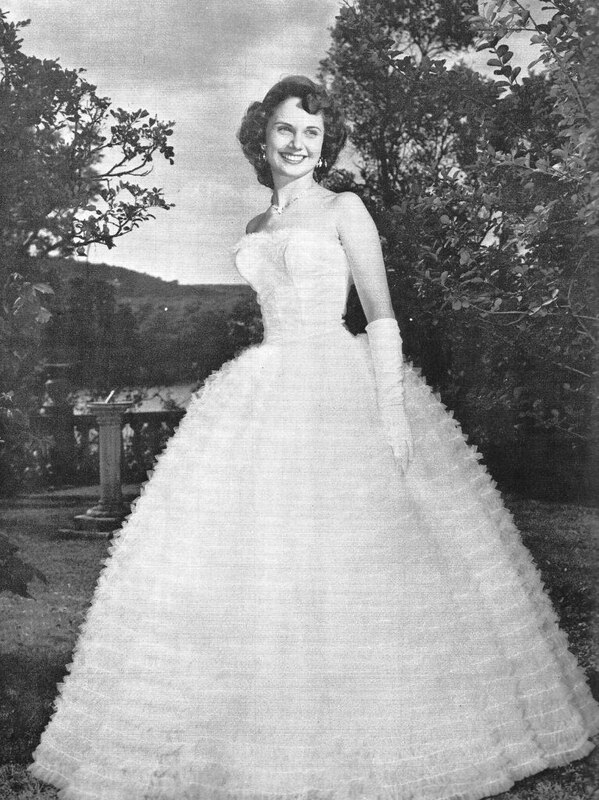 In the 1950s, a short concert was played Monday, Wednesday, and Friday afternoons from 12:50 – 1:00 p.m., during class change. Listen to the very end as the bong of the big bell marks the hour. Above: The Main Building and Tower in 1954, as seen from Mary Gearing Hall.